What activity brings you a sense of satisfaction? For me, it can be tackling a project I’ve dreaded and finally finishing it (like getting those pictures I’d had stored on my phone for many months organized and printed!) Deep cleaning part of my house or preparing some meals ahead of time also makes me feel satisfied. Where this definition really hit home was when I came to Psalm 37:4. I’d never really broken down for myself what it means to delight in the Lord. When I put the definition of “delight” into place, encouraging thoughts came to my mind. Delighting in the Lord means looking for true happiness in God. I can feel pleasure as I grow to know and serve Him. Additionally, delighting means finding my satisfaction in Him. I’m not out looking for other people to fulfill me. I don’t believe that having a nice house or a well-paying job or traveling to Europe will satisfy me. Everything I need can be found in Him. I wanted to share this list of things we can consider as we seek to delight in the Lord. His characteristics. If I’m going to delight in someone, I need to know them! As I learn about God, I can find so much that brings me joy. He is all-knowing, merciful, gracious, all-powerful, loving, holy, faithful, just, righteous, and so much more! The more that I come to know about God, the more I will delight in Him. His works of creation. I can certainly find pleasure here! When my daughters and I were in Greenville a few weeks ago, we caught a glimpse of the mountains in the distance – one of my favorite parts of creation! God has given us so much beauty in the world – from flowers to rivers to sunsets – and we can certainly delight in each one of them. His providence. There is not only joy, but peace and rest in knowing that God guides my every step, and has a plan and a purpose for my life. Delighting in the Lord means I’m recognizing His presence and am aware of His working in my circumstances. His redemption. Salvation is a free gift, yet Christ paid the ultimate price for it. Therefore I don’t have to worry about what will happen to my soul when I die if I’ve trusted Jesus as my Savior. His Word. I find all that I need to live my Christian life in the words of the Bible. It teaches me about God, reveals my sin, and shows me His promises. Worshiping Him. Praising God can be a big part of delighting in Him! I can begin with expressing thanks for who He is and what He’s done. Also, reading a Psalm aloud or singing a hymn helps me to delight in God. His people. It’s a blessing to be with other believers. We can encourage each other to keep our focus on God, and praise Him together. Ultimately, God wants to be our heart’s desire. As I learn to delight in Him, I will set aside other things and realize that all I need is found in Him. Delighting in the Lord is also good practice for heaven – I’m sure that it’s part of what we’ll be doing there! Oh, yes! I’m sure we’ll be delighting in the Lord in Heaven! I can’t wait! 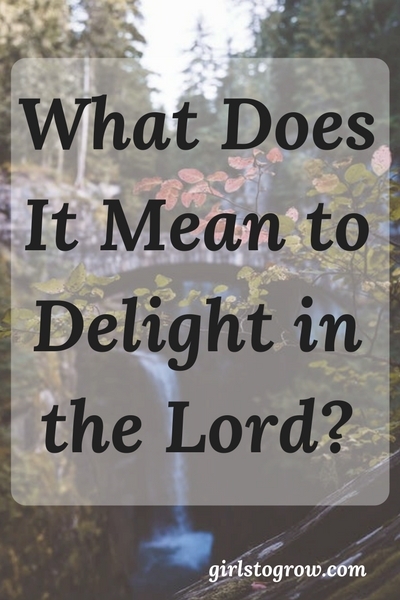 I appreciate how you’ve expounded on the word “delight.” What a neat way to look at delighting in the Lord!